The circa-1906 Book Building on Houston Street and a cluster of neighboring historic structures are being eyed for a $36 million redevelopment, according to a permit filed with the state. 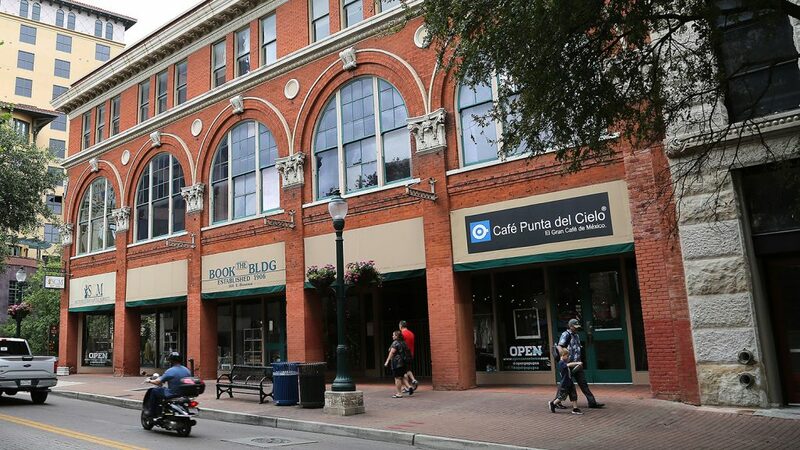 The cluster—some of which faces the River Walk—includes the old Clegg Co. building (which is hidden among the River Walk’s tree canopy), the Veramendi and Kennedy buildings (which front Soledad) and the remaining portion of the old Solo Serve. The other half of Solo Serve was demolished and has become a nine-story Hampton Inn and Suites/Home2 Suites by Austin-based Merritt Development Group that is nearing completion. 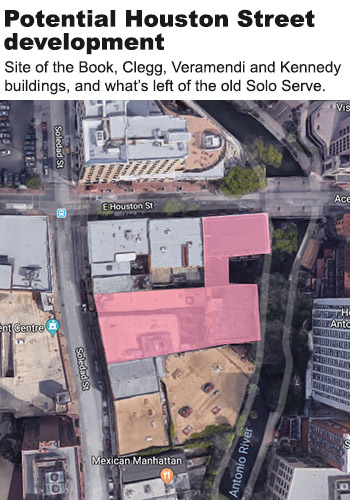 The permit does not indicate the type of project the landowner, Soledad House LLC, an affiliate of Austin-based AMS Real Estate Services, is going for. Construction is scheduled to begin Jan. 1, and will take exactly two years to complete, according to the document. The permit does not address any type of demolition. Such requests would have to be approved by the Historic and Design Review Commission (HDRC). The cluster was long owned by Service Lloyds Insurance Co. of Austin, before it sold the properties in 2016 to its current owner. Three years ago, Dallas developer Woodbine Development proposed a 21-story AC Hotel by Marriott, and the plans, which included the demolition of the Clegg building, eventually were approved by the HDRC. But the developer abandoned its plans the next year. An interview request to Soledad House LLC, made through design firm Clayton & Little, which is working on the project, was not returned. Currently, there is a huge appetite for new retail on Houston with projects underway by GrayStreet Partners and Weston Urban. They’re trying to capitalize on the growing number of tech companies and workers slowly moving into the corridor.